An acquaintance had become a lover, might become a husband, but would retain all that she had noted in the acquaintance; and love must confirm an old relation rather than reveal a new one. It is easy to sympathize at a distance,' said an old gentleman with a beard. 'I value more the kind word that is spoken close to my ear. Railway termini. They are our gates to the glorious and the unknown. Through them we pass out into adventure and sunshine, to them, alas! we return. Our final experience, like our first, is conjectural. We move between two darknesses. The traveller who has gone to Italy to study the tactile values of Giotto, or the corruption of the Papacy, may return remembering nothing but the blue sky and the men and women under it. I hated the idleness, the stupidity, the respectability, the petty unselfishness. In Europe life retreats out of the cold, and exquisite fireside myths have resulted—Balder, Persephone—but [in India] the retreat is from the source of life, the treacherous sun, and no poetry adorns it because disillusionment cannot be beautiful. Men yearn for poetry though they may not confess it; they desire that joy shall be graceful and sorrow august and infinity have a form, and India fails to accommodate them. They cared for no one, they were outside humanity, and death, had it come, would only have continued their pursuit of a retreating horizon. I won't be protected. I will choose for myself what is ladylike and right. To shield me is an insult. 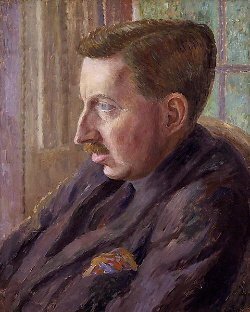 Bio: Edward Morgan Forster was an English novelist, short story writer, essayist and librettist. He is known best for his ironic and well-plotted novels examining class difference and hypocrisy in early 20th-century British society.